New feature and bug fixes. GSeat: MonteCarlo Particle Simulator based on GEANT4, for simulation of single-event effects. VisualParticle: Graphical Interface to GSeat. Experimental support for half-implicit transient-mode solvers, offers 5x faster simulation speed. Ray-tracing optics that supports lens and mirrors. Better cell truncation at boundary element, improved convergence. Fine-tuned ASM linear pre-conditioners, improved convergence. Improved curve-tracing algorithms for better detection of snap-back points. Support Interconnect in circuit/device mixed-mode simulation. Faster searching algorithm for tunneling partner node at semiconductor/insulator boundaries. More accurate integration algorithm for transient simulation with optical- or particle-induced carrier generation. Free-carrier optical absorption is supported. Fixed a parameter in Philips mobility model. Fixed materials parameter of Ti and Tungsten. Extended syntax: list values are supported in options. Updated data format for importing energy deposition profile from GSeat particle simulation. Calculates and outputs capacitances of all electrodes in AC simulation. Import mesh file of the original Suprem4GS data format. Defining interconnects in simulation control. Scripting support in visualization module. Warning and information messages displayed in log console window. Fix a bug in constant current sources. Added parameters to control the density of doping profile rays. Fixed several bugs related to regions with holes. Fixed a bug in GDML mesh export. Calculate doping concentration only in semiconductor regions. Support Box object in GDSII mask file. Stylized preview of mask graphs. Adaptive pseudo-time steps, allows pseudo-time analysis to converge in fewer steps. Improves BDF2 time-discretization, prevents inaccurate time-derivative estimation when carrier concentration is rapidly decreasing. Improves efficiency of importing radiation particle trajectory. More robust implementation of ray-element intersection calculation in ray-tracing optics. Fixes importing of boundary condition in CGNS. Editing user-defined circuit symbols and components. Define mesh-size-control boxes, in addition to control lines. Proper truncation of triangle and tetrahedron with obtuse angles. Small-signal AC analysis for devices with resistive metal regions. Pseudo-time analysis mode for device simulation. Devices with floating regions, or other difficult-to-converge problems, have much improved convergence property with pseudo-time method. Iterative linear solvers can be used instead of direct solvers, drastically saving memory. Re-order circuit variables in vector and Jacobian matrix, improves convergence. Gmin-ramping and Source-ramping in device/circuit mixed simulation. Updated build system on Linux, with updated and optimized numerical libraries. Requires RHEL5 and above, support for RHEL4.x stopped. Fixed bugs related to distributed mesh. More complete support for simulation control options, including Gmin-ramping/Source-ramping in device/circuit mixed simulation. Create and edit custom circuit component libraries. Edit mesh-size-constraint items in device drawings. Improvements to the setting profile manager. More mask generation options for SRAM. Fixed well contact doping in SRAM example. Fix crash under Windows due to read violation. Update 3D mesh refine example (PN_Diode/pn_refine.inp). Fix excessive message box when job finishes. Option to adjust voltage reference used in potential damping. Improve parsing of large numbers in input files. Allow multiple and intersecting fill-objects. Improve formatting of large numbers. Bug fixes with some new features. 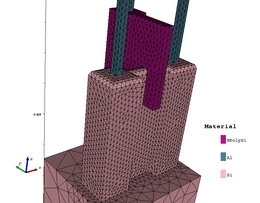 Distributed mesh storage, significant memory usage reduction in parallel simulation. Added GaN and AlGaN material models. Fix current direction calculation at heterojunction. Fix typo in GUI that breaks polygon item in simple masks. Waveform modulated (in time) by an envelope for light and irradiation sources. Effective surface E-field for mobility calculation is turned-on by default. Exporting mesh and solution in DF-ISE format. Fix Jacobian matrix for some displacement current components. Fix error in importing 2D elements in DF-ISE file. Updated Python interface and documentation. Added support for Windows 64bit platform. Added support for incomplete-ionization of dopant impurities. More efficient data structure to store solution data. Overhaul of the storage of user-defined solution variables. Load material optical parameters from data file. Improve support for quadrilateral mesh element with high aspect ratio. Fix bug in calculation of carrier quasi-Fermi-level when Bandgap narrowing is present. Fix bug in doping profiles calculation. Improves the editing of configuration profiles. Improves the mesh quality near region boundary. Enhancements and Bug-fixes to the 1.7.0-1 release. Added support for lattice heating and energy-balance solvers in resistive metal regions. Turn off experimental triangle truncation algorithm, which proves to causes instability. Fix ray-tracing crash when the intensity of one polarization vanishes at interface. Overhaul of the storage of solution variables. Fix bug in placing doping profiles using a mask with holes. Allow users to edit and switch configuration profiles. Improves to import of doping profile in Device2D. Synchronize selection between column view and the main spreadsheet. Maintenance release for the 1.6.x branch. Incorporate new GUI features of 1.7.0-2. Fix boundary width when importing mesh file. Improve stability of Sharfetter-Gummel discretization. Incorporate new GUI features of 1.7.0-1 and 1.7.0. Bug-fixes to the 1.7.0 release. Fix nearest boundary node searching. 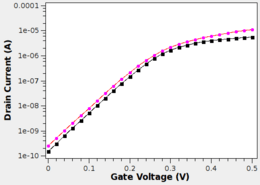 Option to limit the maximum voltage ramp rate in transient simulation. Save boundary label in CGNS even if it has no mesh node (yet). Fix python scripting in Win32. Fix memory leaks in XY plot. Improve efficiency in calculating doping profiles. The 1.7.0 release contains many new features in the Genius simulator and the VisualTCAD GUI. A new product GDS2Mesh is released, and included in this version. Support realistic metal regions that is resistive. Resistive metal regions is allowed to be in contact with each other, circuit cells are constructed this way. Major speed-up in simulating large structures. Loading a 100K node structure is almost 10 times faster, the matrix assembly step is almost 2x faster. The overall speed up for SRAM simulation is ~1.5x. Experimental support for gate current (tunneling and hot carrier). Support TIF3D mesh data format. Saving/loading XY plots to disk. Predefined palette for curve style/color in XY plots. In 2D device drawing, import 1D/2D doping profile from file. Probe multiple variables in device. Construct 3D TCAD model directly from GDSII mask layout. (included in the Linux package, but licensed separately). Device 2D: correctly handle doping profile with zero height. Mixed simulation: support numerical device with 32 pin (up from 7). Improve pseudo color plot in visualization module. Support setting background doping concentration and mole fraction of material ares. Support "Opaque" rendering mode, which is faster over remote display. Allow boundaries and contacts to have different width in the Z-direction. Fix bugs related to impact ionization and band-to-band tunneling model parameters. Fixes stdout/stderr buffer problem when using pythonw on windows. Public release with numerous bug fixes. Test version released to distributors and selected customers.